Hiyas. It's been SO Long since I've posted. I was busy working on all my holiday presents. The biggest and most time consuming present was a knit afghan I was making for my dad. I got so tired and frustrated with it it turned out to be a lapghan. 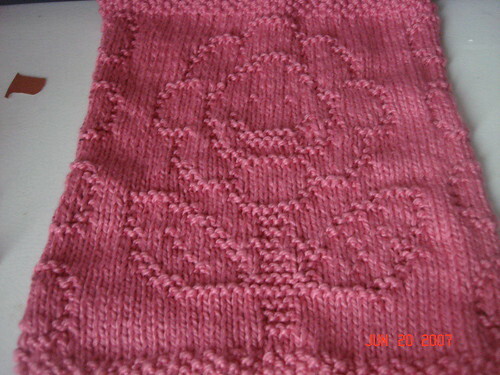 It was a cable pattern done in Caron Simply Soft. It was a lot of fun but very slow in progress. 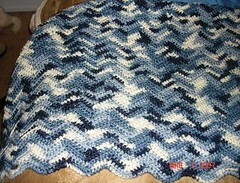 I love my knitting but afghans are so much faster done in crochet. I also made my sister a new scarf. Figured it'd be a nice gift since she now lives in Massachusetts. 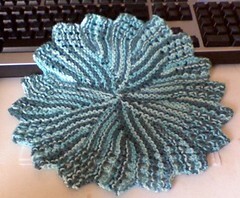 I also worked on a plethra of dishcloths. I made 4 for hubby's co-workers, 1 for my sister in law and 2 for my sister. 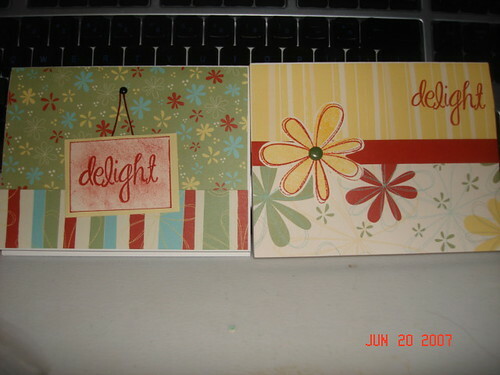 Along with my knitting I made some greeting cards for my mom. 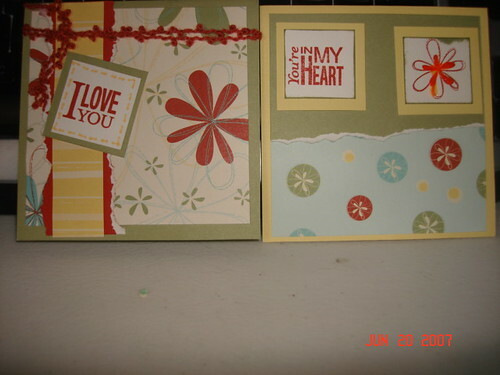 They were done with a Close to My Heart card kit which I had purchased awhile ago. I also made 2 altered notebooks for 2 friends. Those were SO much fun. Also for one of my friends I made an altered tin to keep track of all her knitting needles. I had a lot of fun making all the altered papercraft gifts. I also made 3 altered post its for my sister in laws and my mother inlaw. Simple but they turned out pretty neat! Now that the holiday season is over I am less stressed. I have a few knitting projects that I want to make and a ton of papercrafting I want to do. 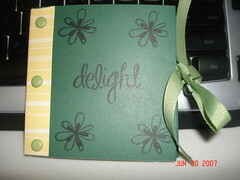 For 2008 I am hoping to really start scrapbooking again. So we shall see! Hopefully before the New Year I will get pix up of all my projects. Excited to share them all! 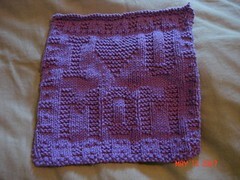 Here is a pix of my first round dishcloth. 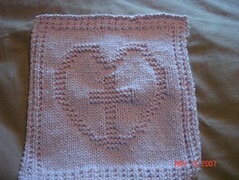 It was done in peaches n cream yarn. Can't remember the name of the color. This was such an easy pattern and I had a lot of fun doing it. This on was done on size 8 needles. I think the next one I do will be done in my usual size 7's. So for those that know me they know that I've always "collected" scrapbook items. I have thousands of pictures in which are just waiting to get put into albums and pretty pages done. I've done a few pages a few years ago and then I started a new hobby, crocheting and knitting. 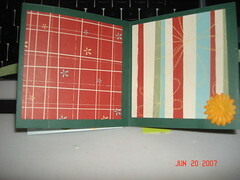 Scrapbooking was put to the side. 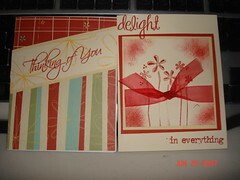 Below are some of the cards that I have made. This is a cute accordian type album. I loved this one. here is the inside. It has a total of 4 pgs. 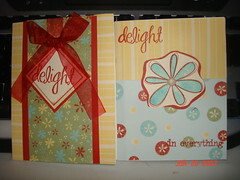 Here are assorted cards that I have done at the 2 workshops I attended. 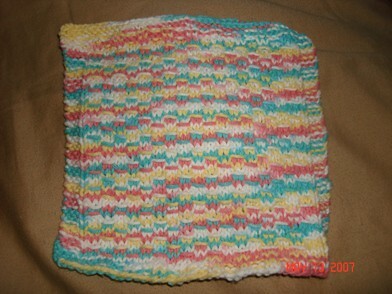 Here is another new dishcloth. This one is a flower. It was a lot of fun to knit up. The yarn used was Debbie Bliss cotton. My friend loves this yarn so I took her advice and decided to try it. She was right it's extremely soft. Pattern is from knitsbyrachel. It's been awhile since I've blogged. Here is my newest project that I finished back in May. 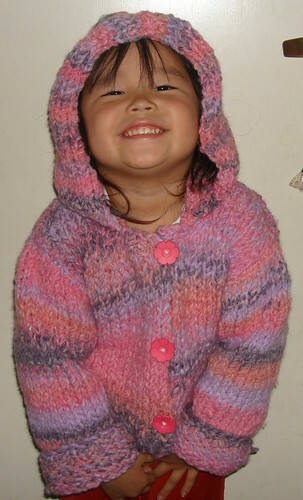 It is another jacket for my youngest daughter. This was based on the sweater which is below, but I made some adjustments along the way to account for the different yarn. 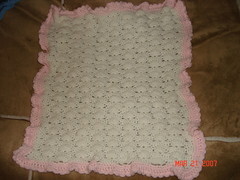 This was made with Muench Big Baby yarn. I can't remember the color name at the moment. But I fell in love this yarn. It's a bulky weight yarn so it worked up really quick. I've been doing a lot of knitting lately. My new thing is dishcloths. 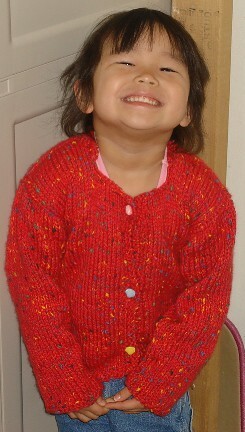 Here are some of the cloths that I knit up for my Mom for mother's day. I finally finished my first knit sweater. This was actually very fun to do. i was afraid that it wouldn't fit but it actually fit quite nice. This is the Rumplestiskin sweater jacket from The Knitter's Stash. It was knit with Muench Tessin yarn purchased from Nine Rubies. 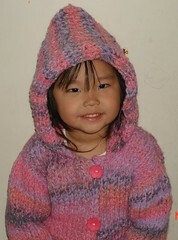 Here is my youngest, Alysia, modeling her new sweater. As you can see she was very happy. I was told that she wouldn't take it off at her daycare. Here are the Easter cloths I made for presents. I made them out Debbie Bliss cotton. Here are a couple of the dishcloths I did for the KAL cloth group I am in. These were a lot of fun to do. I have a few more that I've finished that I'll post shortly. well lately i've been knitting constantly. I finished 2 KAL. (will post pix later) Also finished up 3 cloths for Easter. 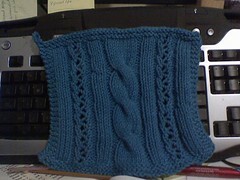 I am still working on Alysia's sweater. just have the sleeves to do. Hopefully i can finish that up sometime this week. I have a few more projects I am going to start soon. Already have the yarn all picked out. Can't wait to start them. Friday I went to my LYS looking for some Crystal Palace knitting needles. Sadly they didn't have the size I needed. I did end up picking up a new brand of needles. They are Bryson rosewood needles. Oh they are so lovely to work with. The lady at the yarn shop gave a great review on them so that was a plus. I also picked up some new yummy yarn. I've been looking at this yarn for awhile but never got around to buying it. It is Plymouth Heaven. 100% nylon. Oh it's yummy. I am working on a ghan for myself with it. Maybe later once my knitting skills have improved I will make a robe or sweater out of it. Here is my newest finished project. This is for my husband's co-worker new doggie. The pattern came from 200 shell stitches. The pattern is called cascading waves. I used an I hook for it. Round 1 of the border was sc. 2nd round was double crochet and the third was hdc shell in one stich then slipping the next around. 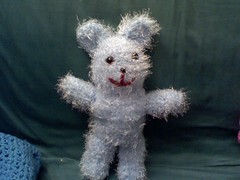 This is "Blue Bun Bun" as my youngest daughter calls it. This bun bun was made by her request as she has a pink bun bun and wanted a friend to go with it. 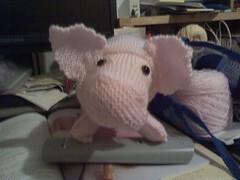 He was made with RH and bernat baby lash yarn with an H hook. It came out a lot larger than I had anticipated but she loves it.